That Wallflower Moment…when your dance card is empty. 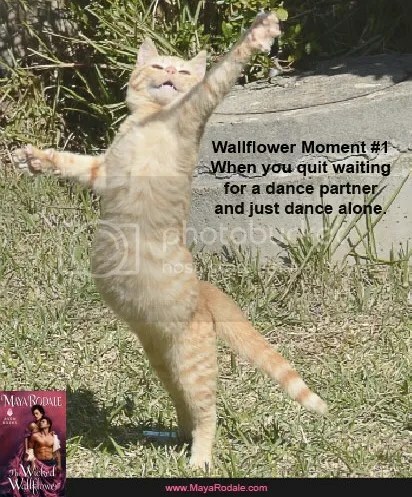 By definition a wallflower has no one to dance with. Since she is most often to be found lingering along the sidelines of a ballroom lamenting an empty dance card, I knew that’s precisely where The Wicked Wallflower—and The Wallflower Moments Blog Tour—needed to begin (as you’ll see in the excerpt below). For the next week I’ll be blogging about all those exquisitely agonizing wallflower moments and sharing an exclusive excerpt from my new series (visit my website for a complete list of stops). Without further ado, meet me in that dim, secluded corner of the party and let’s raise a glass of lemonade to all the moments only wallflowers will understand! Introducing…Lady Emma Avery, heroine of The Wicked Wallflower, and her friends Lady Olivia Archer and Miss Prudence Payton. Also introducing the queen of the mean girls in 1820 London, Lady Katherine Abernathy. “I hardly have any names on my dance card,” Emma said, slightly despairing. This was not how she imagined her debut. “I haven’t any,” Prudence replied glumly. “I wager her dance card is full,” Prudence said. They all turned to look at Lady Katherine Abernathy—blonde, beautiful and mean—surrounded by a gaggle of young, handsome suitors. She smiled like a cat in cream. Question: At a party, will we find you on the dance floor or with the wallflowers? Thank you so much for stopping by Teatime, Maya! Best of luck with the release of The Wicked Wallflower. Remember to follow Maya’s blog tour and join her at RT Daily Blog tomorrow! Connect with Maya at her website, Twitter, Facebook, and Pinterest. You can order The Wicked Wallflower at Amazon and B&N. Welcome Maya! I really love your books. I know I sound like a total fan, but who cares. Looking forward to this one! Oh was a delicious tease of an excerpt! I can’t wait to read it all. Thank you so much for stopping by, Maya. I’ve enjoyed all of your stories and I’m excited to know there are more on the way. Thank you Ladies of Teatime for inviting me here today! I’m glad to hear y’all enjoyed the excerpt and it’s totally ok to sound like a total fan…we all have our fangirl moments! Happy Reading! I have a soft spot for wallflower type heroines. The new series sounds fun. You’ll find me with the chaperones or chasing down a gentleman to dance with wallflowers. Dancing, even if with other women or by myself. I’m one of those strange people who can’t stand still when there’s good music playing and if I see a guy who looks like he’s itchin’ to get on the dance floor, I’ll walk right up and ask HIM to dance. Never know unless you ask. Thank you so much for being here today, Maya! 🙂 I’ve started reading The Wicked Wallflower, and I’m loving it so far. Natch. As for your question, I’d probably be with the wallflowers, not on the dance floor. I don’t dance well, or often, and am too self-conscious. With the wallflowers, I’m with my own people! lol. Hmmm I’m still a wallflower so I’ll most likely be with the other “much” younger wallflowers. Err, well not exactly. More like I’ll be at the food stand and punch bowl. Yea that’s about right. I’m not a dancer or a party goer so I’ll be hanging around elsewhere. I know, it’s sad. I’m a wallflower. It’s only in my head that I can have all the witty remarks and I’m not exactly graceful. Generally, you’ll find me with the wallflowers.